In the 1960s, China's Beijing Automobile Works produced its own "jeep", the BJ212 which was largely a Chinese copy of the Soviet UAZ-469B. Often called the “Beijing Jeep”, the BJ121 was widely used in both military and civilian service in China, with over 200,000 produced by end of production in 1983. In May 1983, American Motors Corporation (AMC) agreed to allow the updated BJ2020S to use the 85hp engine of the XJ Jeep Cherokee. The latest Chinese light utility will be the BJ2022JC 'Brave Warrior', built by Beijing Benz-DaimlerChrysler Automobile Co. Adapted from existing Mercedes Benz designs, the BJ2022JC will carry 0.7 ton, with a wheelbase of 110 inches, and has an independent suspension system with a 101.5 kW 3.2 L turbo-charged inter-cooling diesel engine. Here is another interesting Chinese military vehicle, and one on which there is not a lot of information. 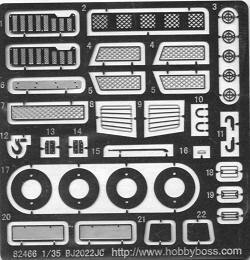 Hobby Boss has each sprue in its own sealed poly bag with a square compartmen t that takes up a goodly amount of box space in which there is a chassis, body, clear sprue, rubber tires and the photo etch fret. Most of the sprues are in a dark olive plastic with one of them being black. The kit is a curbside without a full engine, but with a well detailed suspension. It has several options including separate doors, the ability to install a winch, an open top with roll cage or you can add the top. The front wheels are designed to be able to be turned which is a nice feature. The photo etch fret is pretty comprehensive and includes grilles, screens, headlight covers, brake discs and a number of other bits and pieces to enhance the kit. Instructions are well drawn and well planned. I note that there is some but not a lot of color information provided during the build itself until it comes to body parts. One doesn't know the shade of the chassis, chassis components, radiator or the interior, so I am guessing black for these, or possibly the interior is an OD or something that matches the external camouflage. 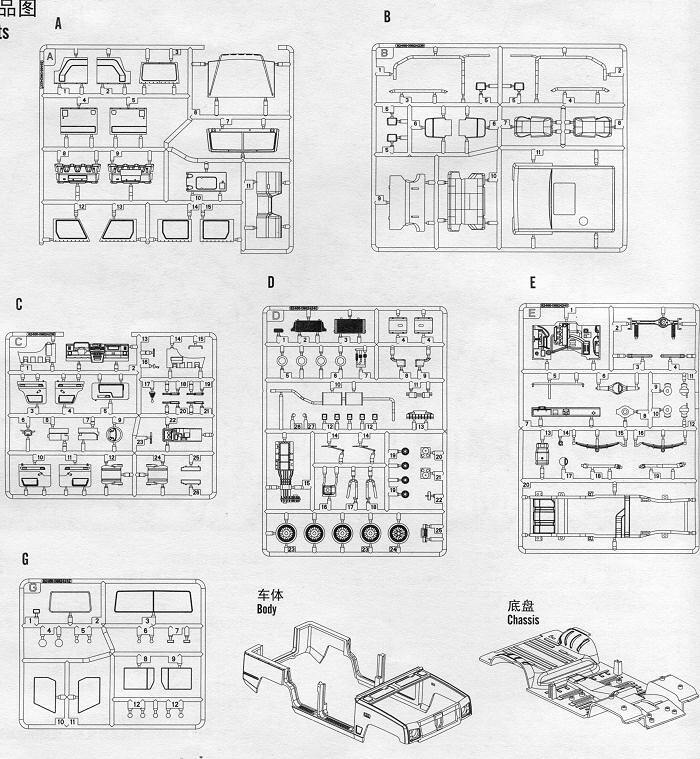 The decal sheet is one of those with a lot of letters and numbers so you can do a wide range of vehicles. The full color external color guide offers six exterior options as well as a number of paint options. 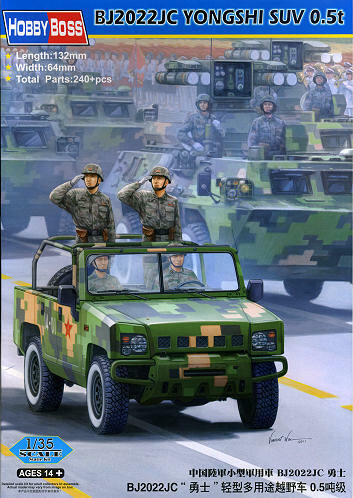 One is the box art vehicle in the parade digital camouflage. Good luck painting this. 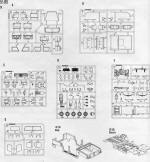 It is hoped that perhaps schemes like this will be offered a decal sheet as it has to be an easier way to do things. Two other parade options are given (meaning big white wall tires). One is in various blues while another is sand and two greens. 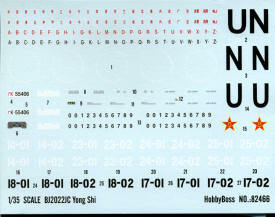 A white UN option is given along with what is listed as a Hungriness camo scheme of tan, brown and light green. Finally an overall dark green general camo scheme. Decals are nicely printed and should work just fine. I've used Hobby Boss decals on several models and have liked how they perform. If you like wheeled military vehicles and especially ones like this (which are more likely to see some sort of action than a tank), then this is for you. I cannot imagine this not being exported as the Chinese are probably one of the major equipment exporters to countries looking for good equipment at a reasonable price. A fine looking kit and one I know will turn out great.